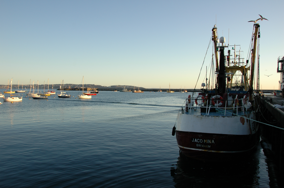 We all went to Brixham fish market the other day it was a cold, very early start with frost on the ground & still dark at five in the morning. We were taken by King Fisher, a company based obviously in Brixham, down to the market but first we had to get welly booted white overalls and a ridiculous hat on we looked right geeks. I was particularly impressed with the size, cleanliness, and the hustle & bustle of the market .The fish were beautiful, fresh as a daisy glistening under the ice chips especially the plaice with bright orange spots so pronounced like little jewels on the dark skin. You only see it that fresh if you are at the market and buy it, or on a trawler. 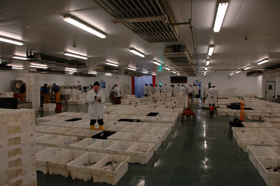 There were so many varieties of fish dover sole, sand sole, pollock, cod, haddock, turbot, brill, gurnard, squid, conger eel, scallops and many more all fantastically fresh. There was also fresh hake which is unusual as it is mostly landed & sold in Cornwall. The actual auctioning of the fish was quite difficult to follow and ascertain what price was reached. We were also shown around the King Fisher production area where all the fish was prepped, that was impressively clean. They can also tell you which boat the fish came from . Altogether a very interesting and informative morning, we then ventured back into Brixham and had a brill breakfast at the Brixham Deli, it really hit the spot, freshly cooked local produce. An excellent end to our trip.